Canada A Country by Consent: British Columbia Joins Confederation: Political Evolution in B.C. Home | British Columbia Joins Confederation | Political Evolution in B.C. Douglas had many good qualities, but a democratic frame of mind was not one of them. He believed that certain people were meant to govern. Mostly he trusted his own decisions and occasionally he consulted an appointed Legislative Council that was made up of old friends of his from the Hudson's Bay Company. As new people moved to the west from the Canadas or the Maritimes where they had already achieved responsible government, they began to refer to this narrow governing elite as the "family compact." 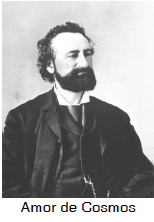 After some pressure, Douglas created an elected Assembly for Vancouver Island in 1856. However, the high property requirements for eligibility to vote or sit in the Assembly, made it a token step towards responsible government. The act creating the mainland colony of British Columbia in 1858 did not allow for an Assembly of any kind. Newspaper publisher John Robson soon began to lead a reform movement against this situation from the colony's capital in New Westminster. Another newspaper publisher, William Smith (who changed his name to Amor de Cosmos because he thought it meant "lover of the universe"), started a similar reform movement on Vancouver Island. In 1863, under pressure from the Colonial Office in London which had received repeated petitions from the reformers, Douglas allowed the election of part of his Legislative Council. This wasn't yet responsible government, however, since two-thirds of the council would still be appointed and responsible to Douglas, not to the people. Finally, in 1864 Douglas was encouraged to retire. To replace Douglas, Britain sent two governors, one for each colony. Both faced problems. The mainland colony was deeply in debt because of the cost of road building to the gold fields. Although the miners appreciated the roads, they proved to be reluctant taxpayers. On Vancouver Island the governor's attempts to tax land and income were resisted by the elected members of the Assembly, like de Cosmos, who would be targets of this tax. In an attempt to make the colonies more governable, Great Britain agreed to proposals for a union of the two colonies and in 1866 Vancouver Island and British Columbia became one colony. There were some arguments about whether the new capital should be in New Westminster (on the mainland) or Victoria (on the island), but Victoria won out in 1868. Union didn't solve the debt problem in B.C., though, and five years later the colony would join the new country of Canada. 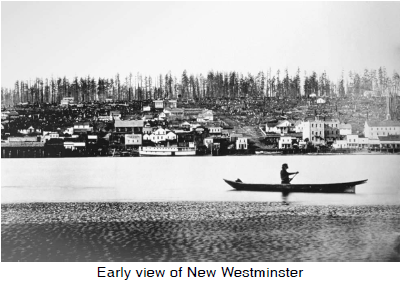 << Prev: Early History of B.C.